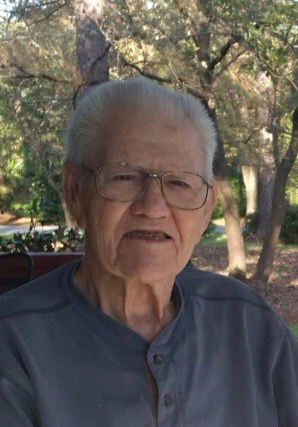 John Kelly Elton, 93, of Albany, GA, passed away peacefully in his home on Thursday, November 29, 2018. A private memorial service will be held graveside at Leesburg Cemetery at a later date. Kelly was born January 23, 1925 in Chauncey, GA. He served his country in the US Navy, and then retired from Southern Bell. He was an avid member of Macedonia Primitive Baptist Church of Sasser, GA. Kelly was preceded in death by his wife Saralyn Elton, his son, Steve Elton, his granddaughter, Ashley Elton, three brothers, Ollis Elton, Bobby Elton, and Cecil Elton, and his sister, Jeanne Stokes. He loved The Lord, his wife and his family. When he was not working or in church, you could always find him with a rod and reel in his hand, as he greatly loved to fish. Kelly is survived by his children, Rebecca “Becky” Butler and her husband, Bill of Johns Creek, GA and James Martin “Marty” Elton and his wife, Donna of Leesburg, GA, his daughter-in-law, Tina Elton of Birmingham, AL, his grandchildren, Kristy Denbow (Ryan), Aryn Elton, Rod Butler (Julie), Sandy Massey (Chris) and Brent Shipman, his great-grandchildren, Isabelle Denbow, Avery Denbow, Chloe Denbow, Sutton Elton, Madi Butler, Kensi Butler, Kayleigh Massey, Meridith Massey and Michael Massey.